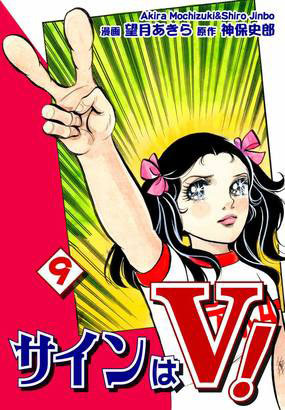 The V peace sign, or piisu sain. 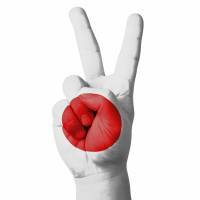 It’s almost mandatory for photos in Japan — the fingers jump up, sometimes both hands, and out spreads the V sign. In the late 1960s, there was a baseball manga and anime called “Kyojin no Hoshi” (“Star of the Giants”). Picture the scene: The main character, Hyuma, is sad because he thinks his father hasn’t come to say goodbye at the train station before an important baseball game. Dad appears just in time, and in a typical “I’m unexpressive but my heart is bursting” macho gesture, he gives his son a big V sign, meaning he wishes him victory (Shōri no V-sain!). Heartened and moved, Hyuma determines to do his best in the big game. Ganbaru! Touching father-and-son stuff. 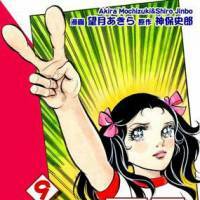 I wonder if there are any Japanese people reading this now who perused these manga in the late ’60s or watched the TV series in the early ’70s. If so, can you recall if this was the first time you started making the V sign? Did you do it for photographs taken after volleyball or baseball games, perhaps? If so, please let us know! This is probably the best-known theory. 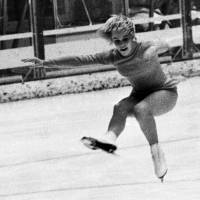 The 1972 Winter Olympics were also held in Japan, in Sapporo, and Janet Lynn — a cute, petite 18-year-old U.S. figure skater — was hotly tipped to take a gold on the ice, having won the U.S. championships five times in a row. But — horror of horrors! — during a spin around two minutes into her graceful, impressive performance, she fell over on her, er, bottom. The gold-medal chance slid away from her. But, to the surprise of the Japanese watching, who may have expected her to be heart-broken or dutifully ashamed, she just smiled, got up and soldiered on. Even at the end, her smile seemed genuine and endearing. This mixture of brave charm, beaming smiles and a positive attitude amid disaster touched and impressed the Japanese, and gained for Janet, in lieu of a gold medal, a horde of devoted fans. She appeared in many magazines, and for her fans, she signed these periodicals with the words “Peace and love,” it being the late hippie era. Rumor has it that she also habitually flashed the V sign. Therefore, the sign become associated with that mixture of smiles, charm and a positive can-do attitude. But where is the evidence for this? Actually, she did not make the V sign at the end of her bottom-bruising performance, nor when she received the bronze medal. Also, despite her supposedly making the sign as she toured round Japan, I cannot find a single magazine photo of her doing so — rather odd that she was not snapped making the V sign that she supposedly popularized. Have any readers seen such photos? Japanese entertainment show “Downtown DX” delved into this mystery and found a connection to commercials featuring Jun Inoue, the singer with popular band The Spiders. He became a celebrity spokesperson for Konica cameras, and in 1972, he beamed into a V sign-adorned smile, camera in hand. Why? I’ve read that he thought the V sign was a trendy thing in Britain. Since the Spiders had made a film in London in the ’60s, could he have seen people making the peace sign there? Or it may have been the director of the commercials who asked Inoue to pose that way. Possibly Inoue made the sign without thinking, the director liked it and kept it as a feature of all later promotions. In any case, it seems clear that this did help promote the tendency among Japanese in general, beyond Lynn’s mostly female fan base. This was aided by the substantial growth in people who had cameras — according to Fujifilm, by 1973 around 70 percent of Japanese people had one. Now, these are the three main theories I have discovered. But there are several more. Another with a possible photo link comes from the fact that “two” in Japanese is ni, and that saying “ni” produces a mouth movement that results in a nice smile for the camera. Over time, the theory goes, people in photos started imitating the photographer’s two-finger gesture, made to trigger the “ni” sound-smile. And how about British Prime Minister Winston Churchill? His habit of flashing the “V for victory” sign during World War II is legendary. The origin of the sign in the U.K. may go as far back as English soldiers using the backhanded version against their French enemies in the wars of 1415. In any case, there is documented footage of a British man using it in 1901. According to some sources, he later stressed that the two fingers of the V sign should now represent Hiroshima and Nagasaki and become a symbol for peace. 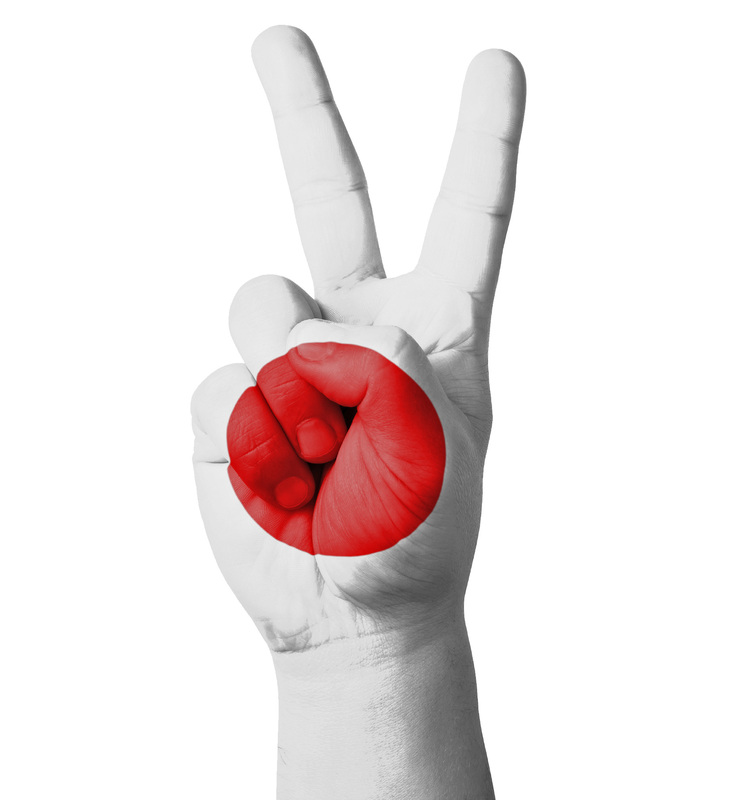 Japanese were apparently moved by this sentiment from a man who had recently been their enemy and took to the V sign. But, again, what evidence is there? I can find none. Japanese people in their 70s that I have talked to have no memory of this. One piece of evidence I have seen is from 1960. The Japanese movie poster for “The Millionaire,” starring Hitomi Nakahara, clearly shows a woman making the peace sign. If it was not popularized until 1972, why is she doing it 12 years earlier? Where did she get it from? The mystery deepens. But let’s close this investigation on an interesting sociological point: How is it that we have such short memories, culturally speaking? This V sign-in-photos habit is not something that goes back to the Heian Era, or ancient Greece — it’s only from about 50 years ago! How quickly the origins of objects and habits that are almost universal become forgotten, as one generation robotically copies the habits of the previous one without asking why. I wonder what stuff we all do now will be forgotten in the near future? In the year 2066, will people have forgotten what a keitai (mobile phone) was? Or swear that hip-hop originated in Tokyo? Will they think that AKB48 was a machine gun? Hmm, perhaps we should start recording this stuff. It might even require a new branch of government to keep the records. I hereby suggest it be called the Ministry of the Mundane.